Perfect for the pocket, purse or wallet. 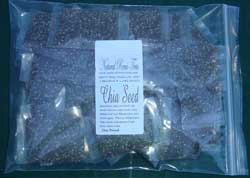 Chia Seeds come in resealable plastic bags. Chia seeds can be easily incorporated into ones diet and can be used with many other foods and beverages. Chia Seeds are a part of a raw food diet. Chia Seeds are high in calcium and help you feel full and grow to 9 times their size when they come in contact with water. Gluten free Chia Seeds Help dieters with energy and raw nutrition. Unlike Flax Seed, you do not have to ground up. Chia Seeds when you make a smoothie. Chia seeds are great for a raw diet because they do not have to be cooked. Not only is Chia great for runners and weightlifters, Chia Seeds are great for workouts. Prior to a run or athletic event in which you need to hydrate, Chia Seeds in a bottle of water will help you hydrate. They will also help with protein to do the event without cramping up. Chia is good for GERD, IBS, heartburn, and sour stomach and the digestive system because it is a hydrophillic colloid. Chia is known to lower cholesterol naturally. Chia Seeds are high in Omega 3 - 1 oz of Chia Seeds has 4915mg of Omega 3. Omega 3 fatty acids are loaded with protein which is great for healthy skin, hair, and nails. Chia slows the Metabolism of Sugar. Chia can help diabetics control normal blood sugar because it is a digest easy food and it is slow to metabolize. Chia Seeds are good for your Thyroid - They are known to help deal with thyroid medication symptoms like lack of energy, dry skin and hair, thyroid weight problems, and colon issues. For centuries the Indians of the southwest and Mexico used this tiny little seed as a staple food. Known as the running food, its use as a high-energy endurance food has been recorded as far back as the ancient Aztecs. The Indians of the southwest would eat as little as a teaspoon full when going on a 24hr. forced march. Indians running from the Colorado River to the California coast to trade turquoise for seashells would only bring the Chia seed for their nourishment.